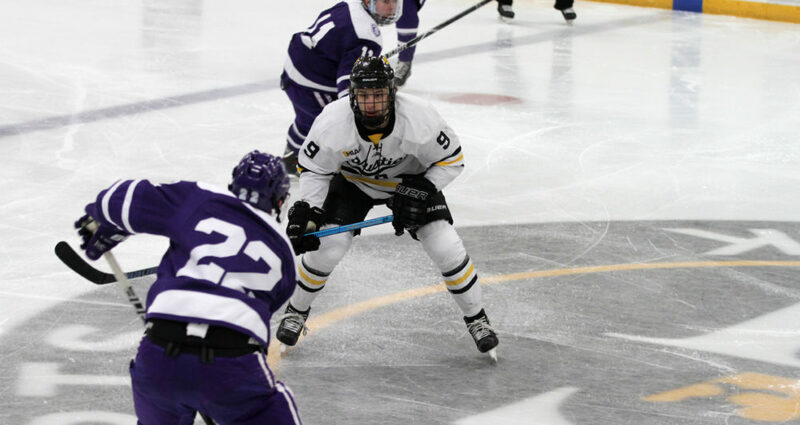 SAINT PETER, Minn. – The Gustavus men’s hockey team suffered a 3-2 overtime loss to St. Thomas on Friday night at Don Roberts Ice Rink, dropping to 5-10-1 overall and 2-4-1 in the MIAC. The Gusties netted the equalizer with 2:31 remaining in regulation, but the Tommies started overtime on the power play and took advantage with the game-winner 56 seconds later. Evan Erickson (Sr., Woodbury, Minn.) scored his first of two goals on the night 6:21 into the first period on a power play. Mason Etter (So., Grafton, Wis.) played the puck down to Caleb Anderson (So., Sioux Falls, S.D.) in the right circle, who made a perfect crossing pass to an open Erickson on the back side for the goal. The Tommies were able to answer five minutes later as a shot skittered through the five-hole and the score read 1-1 at the first intermission. After a scoreless second period, the Tommies took a 2-1 advantage at the 6:13 mark of the third on a two-on-one break. With time winding down, Erickson scored his sixth goal of the season in nearly identical fashion as his first of the game. Anderson made another crossing pass from right to left, finding Erickson for another power play goal on the back side. At the end of regulation, the Gusties were called for a tripping penalty, which set up the game-winning power play goal for the Tommies. Chris Amsden (Sr., Saint Peter, Minn.) suffered the loss in goal after making 19 saves. The Gusties outshot the Tommies 27-22 and went 2-for-5 on the power play, while the visitors were 1-for-2 on the man advantage. The two teams conclude the series at 7 p.m. tomorrow in Mendota Heights.